The Carroll County School System’s Performing Arts Center is a newly-constructed 42,500 square foot venue located west of Atlanta in Carrollton, Georgia. Only 11 miles from I-20, the facility offers convenient access, a state-of-the-art 1100 seat auditorium, meeting spaces, an exhibition room and a spacious lobby. The Center is the most acoustically calibrated facility in the western portion of Georgia. The primary purpose of the Center is to provide Carroll County students with a world-class venue to showcase their talents in music, drama and other fine arts activities. In addition, this facility will provide performers, patrons and the community with access to a broad range of programs and performances to inspire, educate and entertain. Carroll County Schools Performing Arts Center operates as a multi-use facility that connects our students and community with a broad range of Fine Arts programs; fosters community partnerships for Fine Arts education; stimulates economic growth for the west Georgia area; and creates an overall premier experience for our performers and patrons. 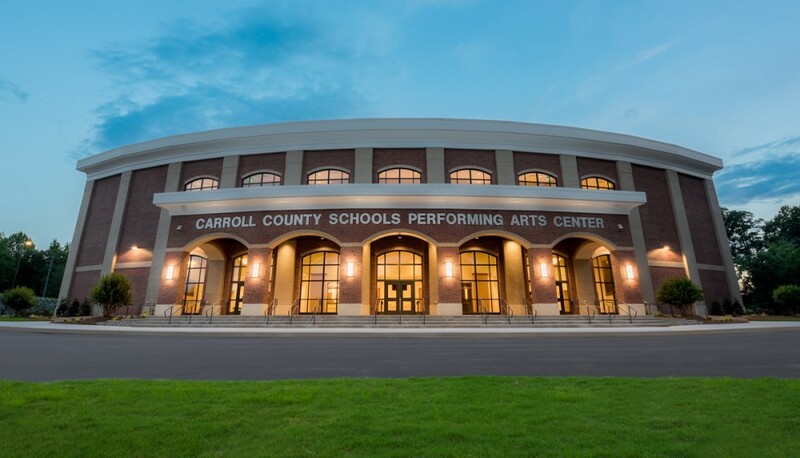 Carroll County Schools Performing Arts Center is a premier facility providing access to educational, cultural, musical and Fine Arts programs that will inspire a lifelong passion for the arts for our students, our patrons and our community.